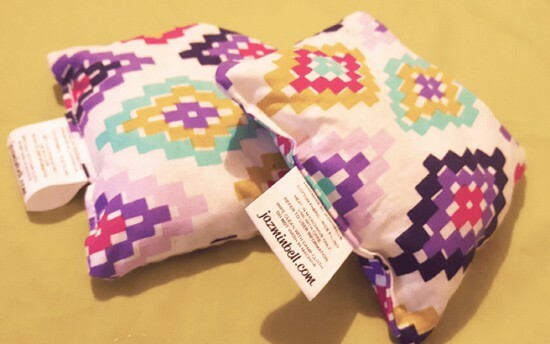 Recently, I was very kindly sent a couple of super cute Mini Cold & Heat packs by Jazminbell Handmade. Jazminbell is an Australian owned business started in 2012 by Jasmin Owen, a Bachelor of Design Arts graduate from the Australian National University. You can use them hot by heating in the microwave, or cold by placing them in the freezer. The rice helps to hold temperature and also makes it easy for the packs to mould to the body. They are lightweight which is especially good for use on injuries. One really great use I found when sick, was using the pack heated and placed over my eyes and nose for sinus relief. Where can you buy these packs? With a great price point of between $15 and $80 as well as a range of styles from eye packs to neck wraps to large sizes perfect for the back, Jazminbell Mini Cold Heat Packs are an essential for every household. Especially those with sport players or suffers of arthritis, gout and fibromyalgia. A special thank you to the Jazminbell team for sending me these packs to try. I use them all the time!